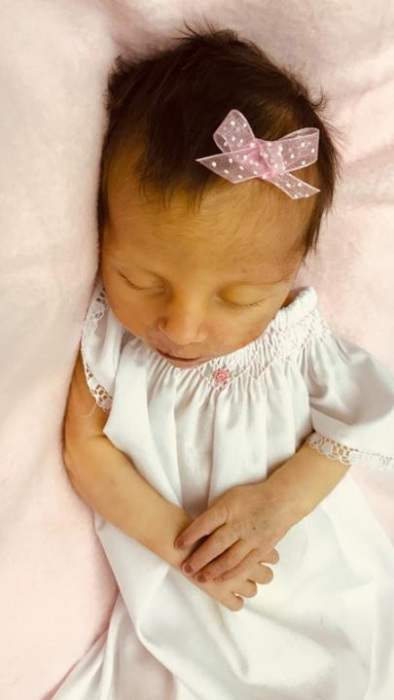 Layla Grace Reynolds, 7 days old, of Concord, passed away Sunday, February 3, 2019 at Carolinas Medical Center Main in Charlotte. She was born January 28, 2019 in North Carolina to Bobby John Reynolds and Heather Lynn Reynolds. The family will receive friends from 12:00 pm - 1:00 pm, Saturday, February 9, 2019 at Hartsell Funeral Home of Concord. The funeral service will be on Saturday at 1:00 pm at Hartsell Funeral Home in Concord officiated by Rev. Brian Davis. Burial will follow at Carolina Memorial Park Kannapolis at Hwy. 29N at I85, in Concord. Survivors include parents, Bobby John Reynolds and Heather Lynn Reynolds, both of Concord, NC; sister, Jasmine Mathews of Concord, NC; nephew, Tyler Hodges of Concord, NC; sister, Mariah Mathews of Concord, NC; brother, Bobby Alan Reynolds of Concord, NC; brother, Nathan Reynolds of Concord, NC; grandparents, James Alan Mathews and Linda Langhorne Mathews of Charlotte, NC; grandparent, Donna Clark and Rob Clark of Concord, NC; grandparent, Teresa Wilson of Concord, NC; aunt, Heidi (Carl Jr.) Parris of Salisbury, NC; uncle, Eric Mathews of Fort Lawn, SC; aunt, Margaret Mathews of Fort Lawn, SC; uncle, Damon (Britany) Mathews of Temecula, CA. Hartsell Funeral Home of Concord is serving the Reynolds family.